Colonial Revival (also Neocolonial, Georgian Revival or Neo-Georgian) architecture was and is a nationalistic design movement in the United States and Canada. Part of a broader Colonial Revival Movement embracing Georgian and Neoclassical styles, it seeks to revive elements of architectural style, garden design, and interior design of American colonial architecture. The Centennial Exhibition of 1876 reawakened Americans to their colonial past. This movement gained momentum in the 1890s and was accelerated by the early 20th century due to the invention of the automobile, which expanded the ability of ordinary Americans to visit sites connected with their heritage. Successive waves of revivals of British colonial architecture have swept the United States since 1876. In the 19th century, Colonial Revival took a formal style. Public interest in the Colonial Revival style in the early 20th century helped popularize books and atmospheric photographs of Wallace Nutting showing scenes of New England. Historical attractions such as Colonial Williamsburg helped broaden exposure in the 1930s. In the post-World War II era, Colonial design elements were merged with the then popular ranch-style house design. In the early part of the 21st century, certain regions of the United States embraced aspects of Anglo-Caribbean and British Empire styles. Colonial Revival sought to follow American colonial architecture of the period around the Revolutionary War, which drew strongly from Georgian architecture of Great Britain. Structures are typically two stories with the ridge pole running parallel to the street, have a symmetrical front facade with an accented doorway, and evenly spaced windows on either side of it. Features borrowed from colonial period houses of the early 19th century include elaborate front doors, often with decorative crown pediments, fanlights, and sidelights, symmetrical windows flanking the front entrance, often in pairs or threes, and columned porches. Brown and Sypherd Residence Halls, University of Delaware. 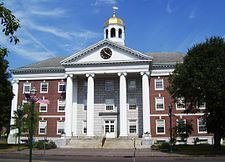 Much of the central campus is built in Colonial Revival style. Alan Axelrod, ed. The Colonial Revival in America. New York: W.W. Norton, 1985. Karal Ann Marling, George Washington Slept Here: Colonial Revivals and American Culture, 1876–1986, 1988. Richard Guy Wilson and Noah Sheldon, The Colonial Revival House, 2004. Richard Guy Wilson, Shaun Eyring and Kenny Marotta, Re-creating the American Past: Essays on the Colonial Revival, 2006. Wikimedia Commons has media related to Colonial Revival architecture.